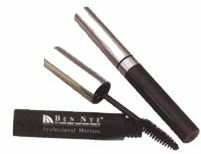 Ben Nye's liquid mascara is smudge and water resistant that gives lashes a durable thickness. The mascara comes in a tank-style container with a luxurious brush applicator. Available in black or brown for traditional applications, clear for men or more natural applications, and Bahama blue and royal purple for more whimsical applications. Each mascara will cover 50 - 100 lashes.